This word cloud has been created from pages in this section on Key Concepts. The larger the word, the more frequently it has been used in the text. 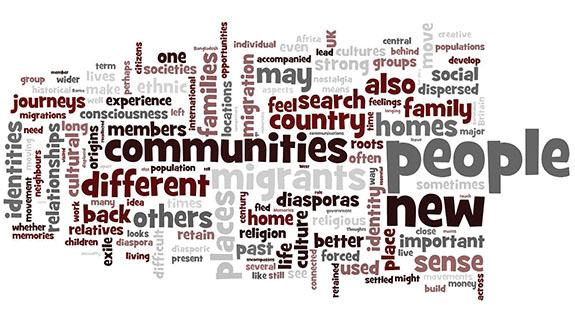 The word cloud reveals what 'Moving People, Changing Places' is all about: migrants and their communities, relationships and identities. Their journeys, families and roots are important, as is their consciousness of being different. Culture and place are significant too. The word 'diasporas' appears, as well as several related terms: others, exile, dispersed. What are the main terms and ideas that will be used in this website about 'Moving People, Changing Places'? The three principal ones are Migration, Identities and Diasporas - and you'll find a page explaining each of those - but there are many others too. See Living Together for an explanation of key concepts such as integration and multiculturalism. Find out more about other important terms by following the links on the left.